If you haven’t been to Ireland, The Auld Dubliner will have to do. 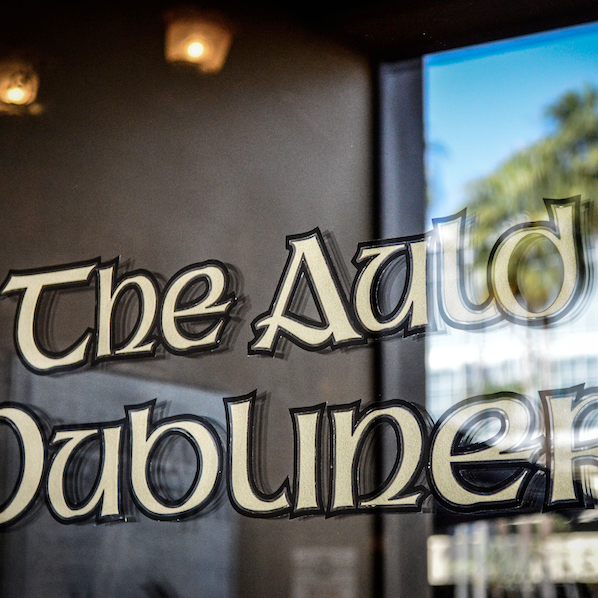 Since 2004, The Auld Dubliner in The Pike has been serving been serving up traditional and contemporary food, all kinds of beverages and a serious commitment to Irish music. Back in the day, in small rural Irish communities, a business owner (the publican) would devote a corner of his business to a place where customers could stop for conversation and a pint of Guinness. Wooden tables and benches, a potbellied stove and oil lamps casting a warm light and a welcoming environment. Publican is what it says on David Copley’s business card, but he’s the co-owner of the Auld Dubliner along with Eric Johnson. In the 1990s, lots of chefs who had been working outside Ireland returned, according to Copley. They had the money to purchase better ingredients than in the past, so at that point the pubs had some of the best food around. That’s the kind of food they have at The Auld Dubliner. The number one choice of customers is Fish and Chips ($9 at lunch, $14 at dinner), and right behind that is the Corned Beef sandwich. The beef stew is Mom’s recipe. Appetizers include Bangor Wontons with Irish port sausage, and Irish country Port Pate, a course country pate with brown bread and crostini. When asked about what first-time visitors should try, Copley didn’t hesitate. “A pint of Guinness,” he said. He also recommended the Corned Beef sandwich. The late night menu kicks in at 10 or 11 p.m. Friday and Saturday starts at $7 and includes crispy bacon and cheddar cheese tots, Sausage Rolls, homemade hot wings, steamed mussels and Tacos. Breakfast highlights on weekends are the Full Irish Breakfast: eggs, rasher, sausage and Black and White Pudding and the Morning After, “guaranteed to bring you around,” according to the menu, with housemade Corned Beef Hash with fried egg. Also the Dubliner Breakfast Burrito with Irish Sausage (of course!) and a Breakfast Boxty, which is filled with sausage meat. There at least 20 beers on tap. Waiting for customers are more than 60 Irish whiskies and a total of 160 whiskies in all. They have specialty drinks including the Dublin Donkey, which is Irish whiskey, Ginger Beer, and fresh lime juice served in a copper mug. What about wine? “We have it,” Copley said. Happy Hour is 4 to 6 p.m. Monday through Friday. Tuesday is Pike Night, buy the featured beer and keep the logo glass. Other specials include fresh oysters for a dollar on Thursday. “Guinness and oysters area a huge Irish tradition,” Copley said. Friday means all you can eat Fish and Chips. The Auld Dubliner has live music every day. Monday through Thursday they feature local bands; Friday and Saturday are L.A. bands. Sunday they have something called an Irish Session: an informal gathering of musicians. Whoever feels like stopping by joins in. “It’s the longest standing one in Los Angeles,” Copley said. Auld Dulbliner Irish Pub and Restaurant is at 71 S. Pine Ave. in the Pike. They’re open from 11 a.m. to 2 a.m. every day and they start serving that authentic Irish breakfast at 8 a.m. on weekends.